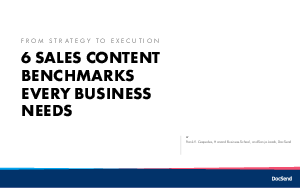 > Docsend > From Strategy to Execution: 6 Sales Content Benchmarks Every Business Needs. From Strategy to Execution: 6 Sales Content Benchmarks Every Business Needs. It’s no secret that content - from case studies to pitch decks - fuels the modern sales cycle. However, a vast majority of teams don't track prospect engagement with sales content, and if they do, it's unclear which metrics actually indicate success. This report, From Strategy to Execution: 6 Sales Content Benchmarks Every Business Needs, reveals 6 key benchmarks for how, when, and where prospects engage with sales content.